Suspension training systems have become very popular in recent years. These systems are great for people who prefer to work out in their own homegym, where they can receive the same exercise benefits as if they were attending a standard gym. The problem lies in the number of suspension trainer on the market. How do you know which one is the best suspension trainer for you? The ones on this list are a good place to start. What Is the Best Suspension Trainer? It helps to begin answering this question with some background on these devices. Suspension trainers consist of a set of straps and handles that are literally suspended off of the floor. Imagine the ring routines that you see male gymnastics doing and you’ll have the general gist of these workout devices. The idea behind a suspension trainer is that it works your core muscles, as well as those in your arms, by having you do exercises that enhance your flexibility, add to your strength, and give you a better sense of balance. Generally, these systems consist of nylon straps with handles at the end. The handles tend to be covered in material like foam, which makes them more comfortable to grip. You have your choice of choosing a system that attaches to a pull-up bar, a door frame, or even the ceiling (or the upper part of the wall) in your homegym. So, which one is the best suspension trainer? Read on to find out which one we highly recommend. 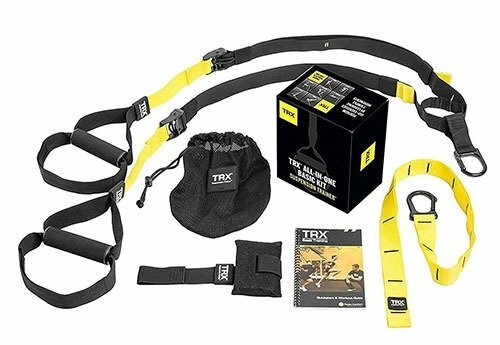 The TRX All in One Suspension Training System is on the list of the best suspension trainers because it’s incredibly versatile. The system comes with both indoor and outdoor anchors, as well as a number of extras, including a workout guide and a mesh travel bag. With the TRX All in One Suspension Training System, you can work out on the go. So, what is the best suspension trainer? This one is a good candidate. It’s designed to help you move outside of your homegym, thanks to the sets of indoor and outdoor anchors. The system includes a set of attached handgrips with lead straps, a mesh travel bag, and the aforementioned anchors. The indoor anchors are made to fit on a door frame, while the outdoor ones will work well with a tree branch. The straps and hand grips are made of sturdy nylon and can support up to 350 pounds. The Ultimate Body Press Body Weight Resistance Trainer has made the list of the best suspension trainers because its handles are very comfortable to grip. It also comes with a fold-out pamphlet of the various exercises that can be completed with it. The Ultimate Body Press Body Weight Resistance Trainer provides one of the best suspension trainer workouts. Both straps are separated in the package, giving you more leeway as to how you choose to use them. It can be a bit tricky when they’re combined and strung onto the same anchor because this can inhibit your movement. The Ultimate Body Press Body Weight Resistance Trainer isn’t like that. 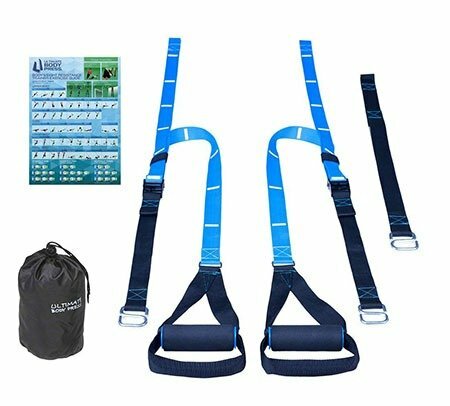 These blue straps with black accents are fully adjustable, come with six-foot extensions, and can be set up with single or multi-point anchors, based on the exercises that you plan to do in your homegym. 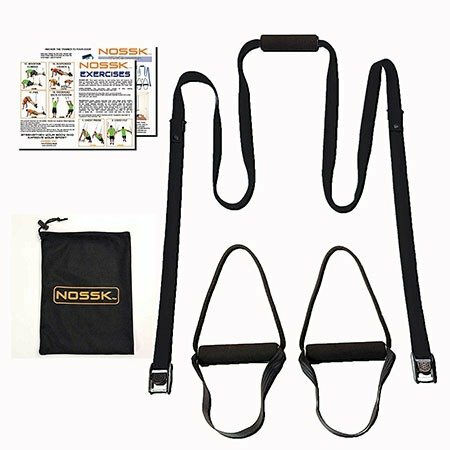 The NOSSK Home Suspension Bodyweight Fitness Trainer is on the list of the best suspension trainer systems because it comes with everything you need in order to do a full suspension workout in your homegym. This is the best home suspension trainer, thanks to the fact that it comes with handles and foot loops. This means that you don’t have to get overly creative when you want to do bridge exercises or others that require you to put your feet in the straps. Although the NOSSK Home Suspension Bodyweight Fitness Trainer is designed to be used indoors only, this doesn’t mean that it isn’t worthy. It supports up to 300 pounds and consists of military-grade webbing. 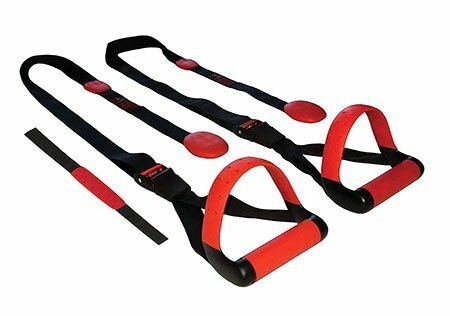 Another on the list of the best suspension trainers is the KEAFOLS Fitness Training Kit. Don’t let the name fool you. This training kit is a suspension trainer – and one of the best home suspension trainers at that. The KEAFOLS Fitness Training Kit consists of two handle straps, two fitness straps, two-foot cradles, one door anchor, one mesh bag (which makes it portable), and one start-up guide. Thanks to the guide, you’ll have this up and running in your homegym in no time flat. The length of the straps can be fully adjusted, and as long as you fully tighten the buckle, they are very safe. They utilize heavy duty carabiners, and the straps are made of military grade nylon. On top of this, the straps can support up to 1,000 pounds. The QonQuill Bodyweight Fitness Training Kit is one of the best suspension trainers because it can be used just about anywhere. The anchors will attach to tree limbs, beans, rafters, above doors, and even poles and pull up bars. You can literally take this with you and work out on the go. 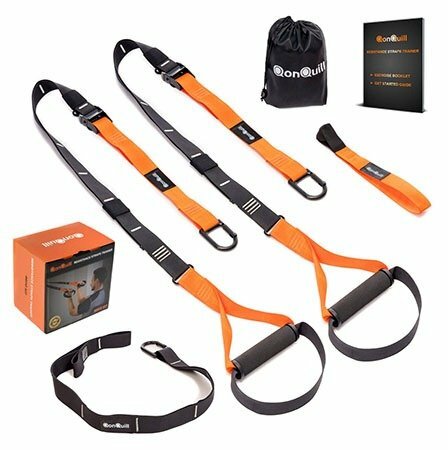 The QonQuill Bodyweight Fitness Training Kit comes in a snappy orange and black color combination. It consists of lay flat handles that have foam comfort padding. The straps are fully adjustable and are designed to support up to 400 pounds. Although this system doesn’t come with separate foot straps or cradles, you should be able to use the handholds for your feet, thanks to the two-fold design. The system also comes with a handy guide and storage and travel bag. So, what is the best suspension trainer? This one comes close to fulfilling every need. If you want a brightly colored suspension training system, then look no further. 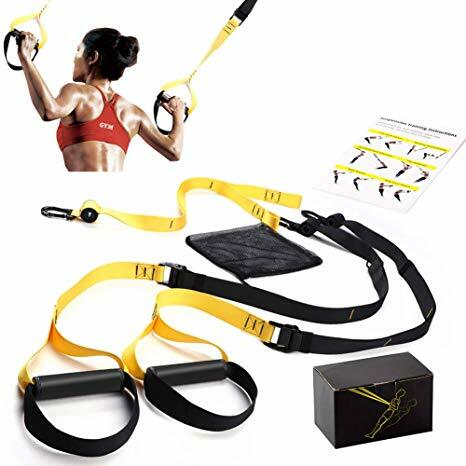 This is one of the reasons why the KODAMO BodyWeight Fitness Resistance Trainer Kit made this list of the best suspension trainers – it comes in a bright “notice me” yellow color. The KODAMO BodyWeight Fitness Resistance Trainer Kit might just be the best home suspension trainer. This system comes with a universal utility anchor that allows you to hang it just about anywhere. It also has built-in foot and hand loops that do double duty. The hand loops have foam padding, which makes them comfortable to grip while you work out in your homegym. This suspension trainer also comes with a 30-day money back guarantee, and it can hold over 800 pounds. The Lifeline Jungle Gym XT made our list of the best suspension trainers because it comes with industrial strength straps. It also has a split anchor design that allows for greater flexibility during workouts. The Lifeline Jungle Gym XT comes with two door anchors (not just one) which allows you to place the straps further apart. This increases the number of workouts that it can handle. On top of this, it comes in an unforgettable red and black color combination and each strap is easily adjustable. The system attaches with plastic “lugs” that fit into between the door jamb and the door. They can also be attached to the straps when wound around something like a pull-up bar. Although the Lifeline Jungle Gym XT can’t support the weight of some of the other contenders on this list of the best home suspension trainers, it is a good addition to a basic homegym set up. 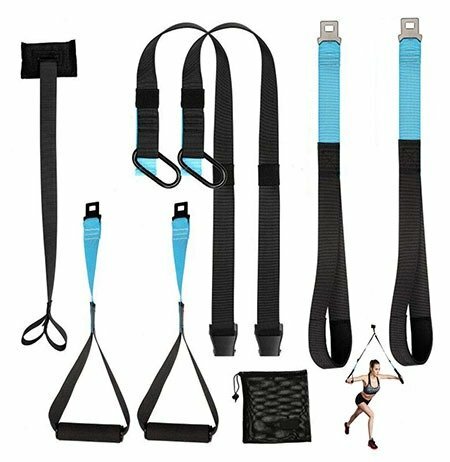 The GoFit Gravity Straps made this list of the best home suspension trainers because they are simple to use and set up. 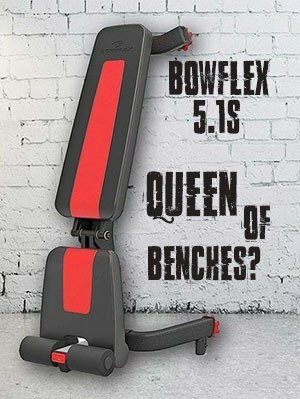 They also are designed to fit over a doorway, ensuring that you don’t need any other expensive workout equipment in order to use them. 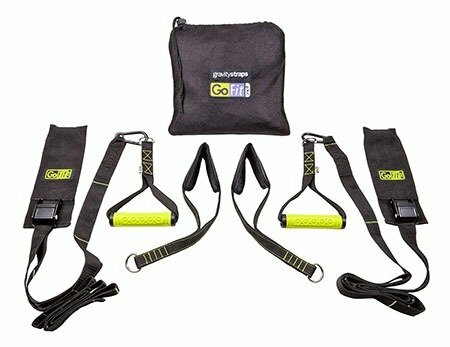 The GoFit Gravity Straps come in a set that includes two straps with door anchors, two detachable handles, two ankle cradles, a training manual, and a mesh travel bag. This is basically all that you need in order to get started. On top of this, the GoFit Gravity Straps can support up to 300 pounds. The straps are made of polypropylene and have metal D-rings. The handles have foam padding, making them very comfortable to use. Which one is the best suspension trainer workout? That depends on what you want to accomplish. If you can do all of these, then you’ll be on your way to being perfectly fit. As you can see, the best suspension trainers are those that consist of sturdy straps and comfortable handles. These trainers made the list, because they support a good amount of weight while providing the best suspension trainer exercises at the same time. You can’t go wrong with any of the ones on this list.